For as far back as he can remember, seasonal workers have been part of Joel Porteous’ family fruit and vegetable farm. In fact, if it weren’t for the approximately 80 Jamaicans that come to their Norfolk County farm every year, that farm wouldn’t be in business today. 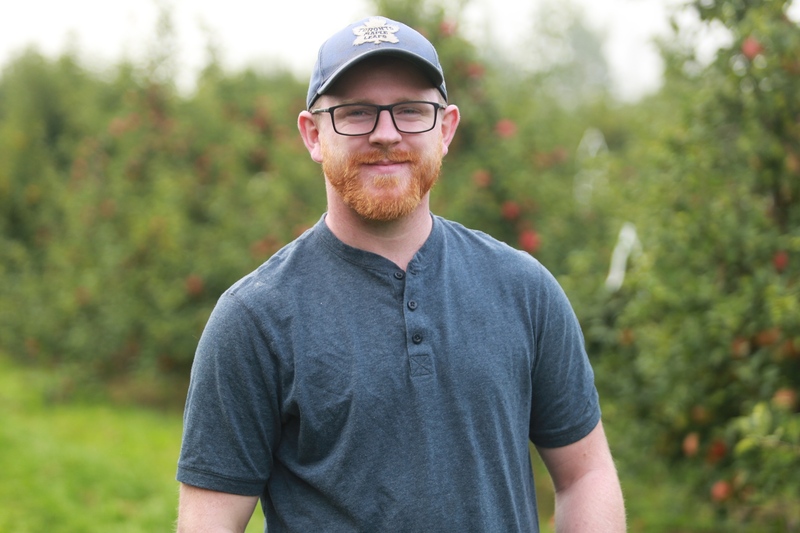 Porteous is a third generation farmer, working with his father Murray Porteous and uncle Ray Vogel on Lingwood Farms Ltd. near Simcoe to grow apples, pears, sour cherries, and asparagus. Although he’s been helping out in the family business since he was a young boy, he joined the farm full-time in 2013 after completing renovations technician construction training at Niagara College’s Welland Campus. “Right now you could say my role is assistant farm manager – I have an ever-updated list of things that need to be done on the farm and I work with our employees to get them done,” he explains. That includes tasks like applying fertilizer in the spring, spreading mulch in the orchards, ensuring food safety compliance, and tracking hours for cost of production calculations, as well tractor work like planting new trees or cultivating soil. Although mechanization in horticulture is increasing, many fruit and vegetable crops, including those grown at Lingwood, still require a lot of manual labour. That includes jobs like pruning, weeding, thinning apples and pears, harvesting, planting, applying crop protection, assembling trellis systems to support trees, and preparing fields by picking up rocks and roots. The work can be physically demanding and the hours are long, especially during the growing season, so finding employees is an ongoing challenge for Lingwood Farms. That’s why the Seasonal Agricultural Worker Program (SAWP) has become a lifeline – in 2018, the farm employed 84 workers from Jamaica. SAWP was founded in 1965 and is a four-way agreement between the governments of Canada, the Caribbean and Mexico, Canadian farm employers, and the seasonal workers. The program is administered through a non-profit organization that facilitates and coordinates the requests from farmers for foreign seasonal agricultural workers. About 25,000 workers come to Canada through this program annually, and many have been working with the same farm employers for decades. According to Porteous, some of the workers at Lingwood have been with the farm for close to 20 years. “Experience is valuable to us and we rely on our more experienced staff to train new workers – and knowing they can come back next year is a good feeling,” he says. SAWP workers receive the same benefits that Canadian workers do, including health coverage through OHIP. They’re also provided with on-farm housing that is repaired and maintained regularly and inspected annually by the local health unit. And that’s not the only agency monitoring fruit and vegetable farmers when it comes to employment. According to Porteous, Lingwood signs a SAWP employment contract with each worker and the workers’ home country sends a liaison officer out to the farm to visit workers, inspect housing conditions, answer employee concerns and monitor payroll deductions. The federal government also completes random audits of farms that employ foreign seasonal workers to ensure they’re being paid correctly, receiving the benefits they’re entitled to and have proper housing and working conditions. As part of that audit, they also have private meetings with workers to ask if there are any concerns that should be investigated. And if there is a serious accident on the farm, Porteous says the Ministry of Labour will conduct an investigation to ensure employees are properly trained on safely operation tools and equipment. “Working with them growing up I learned a lot of good work habits. As a young teenager working with the guys, I am certain they had a positive effect on my own work ethic,” he says.